158 pages | 15 B/W Illus. The collapse of the French army in 1940 is a well-researched topic in Second World War Studies but a surprising gap in the historiography emerges when it comes to the study of the French military prior to the German offensive of May 1940. Using various public and private sources in different languages, this book aims to address this gap by studying morale on the frontline and its management by the French Government, the Grand Quartier Général, at the scale of the regiment and on a personal level. 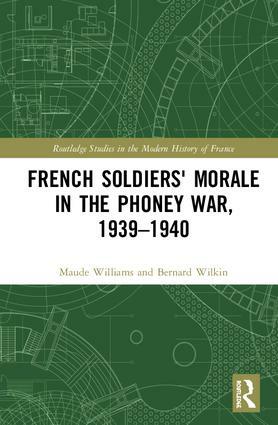 This research also investigates German and British propaganda in French and aimed at the French sector of the frontline in order to offer the first comprehensive comparative study of French army morale in any language. Maude Williams is a French historian working at the University of Saarland in Germany. Her research looks at wartime propaganda and rumours, war evacuations in 1939–1940 and more recently at Franco-German music transfers in the 1960s. She has written several articles on these topics. Bernard Wilkin is a Belgian historian working at the State Archives of Belgium. His research investigates wartime propaganda and the French army from 1799 to 1945. He is the author of Aerial Propaganda and the Wartime Occupation of France, 1914–1918 and seven other books.